You may have noticed the word "design" being talked about recently. Perhaps you've read about design thinking in a recent business publication, or noticed the phrase being used in discussions on innovation where you work. Maybe you've heard about Stanford's newly-founded d.school. That's a lot of hype. What is true is that design is changing the way innovative businesses operate. Successful companies like GE, Procter & Gamble, and Maytag have made significant investments and organizational changes to take advantage of design process and methodologies. Design as an innovative problem-solving methodology is fast becoming an imperative business strategy. Our success at Red Hat is due to one of the biggest and most successful collaborative/transformative innovation models ever--open source. The value we bring to IT customers the world over is unquestionable and defining. Open source, at its heart, is a design thinking process. What follows is a Q&A with David Burney, Vice President of Brand Communications + Design at Red Hat. Burney is a champion of design thinking. Red Hat Magazine: What is design thinking? David Burney: Design thinking is a term being used today to define a way of thinking that produces transformative innovation. While the term feels trendy, the way of thinking is hardly new. One can think of the cave painters in Lascaux 25,000 years ago as design thinkers-- they first began to collect data about the world they experienced, express that data by creating visual stories, document those stories in a way that could be shared into the future, and use that data to create new and innovative ways to solve their problems. The creation of alphabets thousands of years later is an example of design thinking. RHM: What does design thinking have to do with design? DB: The word "design" has a lot of different meanings for a lot different people. Often when people think of design they think of an artifact that's been designed well--such as a chair, a car or a building. Or they think of design as style or fashion--a great pair of shoes. The term 'design thinking' has gained popularity because it makes it easier for those outside the design industry to focus the idea of design as a way of thinking about solving problems, a way of creating strategy by experiencing it rather than keeping it an intellectual exercise, and a way of creating and capturing value. RHM: Is design thinking exclusively art/design-related? DB: That's a pretty big question. If I could determine the nature of art, then maybe I'd have a chance of answering it. Ellen Lupton, who is a very good designer and a leading writer on design, says that design is "art people use." I like that answer. What I find interesting in your question is that art, design, and design thinking are all about creating something new--in that, they are all transformative in nature. There are very real and important differences between processes that tear down to innovate, or processes that gather best practices to innovate, and creation processes that innovate. They demand very different actions, different cultural ways of thinking. RHM: What impact does design thinking have on the way businesses operate? DB: That's a great question. There is one philosophy that businesses only turn to design when they're desperate. After they've competed on price, delivery, systems, etc., and they find their business is totally commoditized and they have no other choice, THEN they turn to design. Some suggest that's true of Apple. Of course, some businesses look for commoditized industries for opportunites to apply design thinking. Then they create new business categories. Even industries. What's more of a commodity than the coffee bean? Then consider what Starbucks has been able to accomplish. Or consider what Nike did in the sports shoe industry. Or Toyota in automobiles. Clearly, today, it's increasingly difficult for businesses, even countries and geographic regions, to find ways to compete. They're finding that iterative methods for generating innovation and value aren't giving them the competitive advantage they're used to. The success of businesses who have built design thinking cultures has begun to be noticed. Innovation and creativity are on everyone's lips. Stanford University has started a d.school. This year, Davos has included design as a topic on its agenda. It's all over the business media. And companies as diverse as traditional marketing giant Procter & Gamble and manufacturer GE, commodity companies like Maytag and LG, are creating new strategies and restructuring their companies--making huge investments--to take advantage of design thinking. RHM: How does it lead to innovation? DB: From my point of view, leading transformative innovation is a very different animal from the processes most often used in the business world, and certainly very different from the cultures that are built to sustain most enterprises. A few years ago, Businessweek editor Bruce Nussbaum stated that less than 5% of Fortune 1000 companies 'get it' when it comes to design. Ironically, I don't think innovation is that hard. In fact, once you can accept that innovation is about generating lots of ideas-- focusing on quantity rather than quality-- you're halfway there. That's first and foremost. It's dependent upon being extremely confident while not 'knowing' the answer. People who demand to know the answer too soon kill innovation. So, that's easy, right? Design begins with the process of defining, and redefining, the issue or problem at hand, because it's terribly important to make sure everyone is on the same page. You can only get there if people are willing to put forth the most basic thoughts and ideas, and use those to create as simple a problem definition as possible. It's extremely important to feel free to suggest bad, even dumb, ideas. IDEO, one of the world's great design firms, actively pursues wild ideas. Because without that mindset you won't have the same ability to innovate; not by a long shot. Because transformative innovation is dependent upon having participants who don't know all the answers. Let's face it, if you know everything--if you have all the answers--it's kind of hard to innovate. Play is important in design thinking. Critical even. Having fun IS often the objective. Giving up ownership. Listening, humbly. Forming teams from people who come from very different disciplines and cultures; not keeping them compartmentalized. Getting into the world and testing things out. Prototyping and failing. These are all good things in design thinking cultures. Traditionally, success in the corporate world is often another matter: Territorial battles, internal competition, opaque agendas, hoarding information; strict structure by function--all are serious detriments to building a culture of design. RHM: What are some examples of companies that embody design thinking as a competitive advantage? DB: I've mentioned a few already. You can add companies like OXO, Target, VW, Progressive Insurance. These are great examples of design thinking-- companies that really involve their customers in co-creation of their products/service--companies that build great systems. RHM: What role does collaboration play in design thinking? DB: Most children easily grasp the concept that two heads are better than one. Well, 40 heads are really better than one. The myth of the lone genius is just that. A myth. I like to remind people that Frank Lloyd Wright is dead. Now, what we're seeing in the development of Linux and other open source collaboration development (design) models is incredible. Look at Fedora! Red Hat Enterprise Linux. Look at the value created! I think we, as humans, are just beginning to tap into the power of large-scale collaboration for creative problem solving. Bruce Mau, who spoke at our Summit last summer in New Orleans, is doing a great job of documenting how large-scale collaboration projects are changing the world. We believe at Red Hat that we have a strong leadership role to play. RHM: How can corporations take advantage of design thinking? 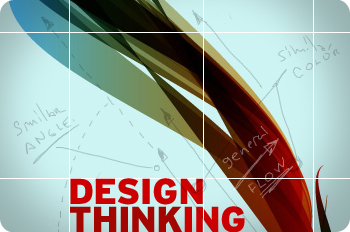 DB: Design thinking is more than a methodology. Design is a cultural way of thinking. It's important to understand its power, commit to evolving your culture, even restructuring the company, resourcing and rewarding those who practice design thinking. You can no longer tolerate those who shut down design thinking. We have to get rid of the devil's advocates and experts who own their domain to the detriment of innovation. 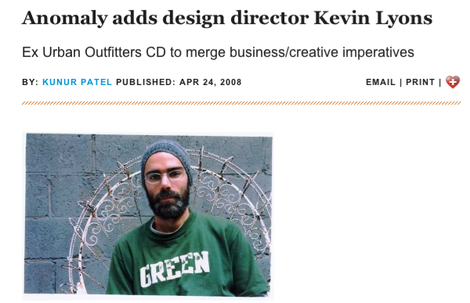 Anomaly has appointed former Urban Outfitters CD Kevin Lyons to design director, to bring what agency co-founder Carl Johnson calls "real world perspective" to its design initiatives.The four-year-old agency has always touted its holistic approach to branding for clients and has undertaken its own product development and design projects, so Lyons' role is intended, says Johnson, to inject the shop with "the pragmatism of retail" that will root its entrepreneurial endeavors in the truths of the market. "Anomaly needs creative people who understand brand development beyond communications," Johnson says. "[Lyons'] experience in the retail/apparel world will be valuable to a company with a financial stake in its work. He knows how product innovation provides customers value and the ultimate pressure of sales numbers, in an ad world unfamiliar with those concepts." "Anomaly needs creative people who understand brand development beyond communications." As more and more advertising gets ignored, agencies have got to come up with better, more meaningful ways to help their clients reach and connect with people. Anomaly gets this. They believe in it at their core. This cuts right to the heart of what I've maybe not been articulating so well by using the words "design thinking" in my previous posts. Maybe "design thinking" isn't the right term. Maybe the title of the post should have been, "The Future of Advertising Is More Than Communications." Anyway, I thought this was relevant to some of what I've been posting lately and was also interesting in regard to looking at what types of people "the agencies of the future" are hiring.